The fire started in the roof of a house on West End road. Dozens of firefighters from across Devon and Somerset have been working through the night to put out a house fire in Bradninch. It started in the roof of the Grade II listed home on West End Road at 11.30pm last night (16th April 2019). 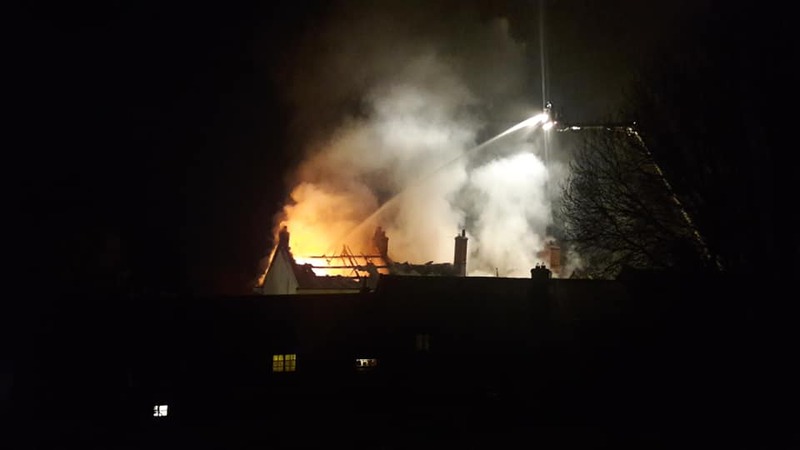 After numerous 999 calls reporting flames were coming from the roof of the home, three fire engines from Cullompton, Middlemoor and Danes Castle were sent out, along with an aerial ladder platform from Danes Castle. Because of the high number of calls being received, Devon and Somerset fire and rescue service sent another fire engine from Tiverton. Very shortly after the first fire engine arrived, they requested a further two fire engines which came from Tiverton and Danes Castle along with an incident command unit from Honiton, a welfare pod from Crediton. The roof of the Grade II listed building was well alight and Western power were called to isolate the power line close to the building. By 11.53pm everyone inside the house had been accounted for. A further two fire engines came from Wellington and Topsham, along with a second aerial appliance which came from Taunton, as well as a water bowser from Bridgwater. Shortly after midnight, salvage operations inside the building began to save the contents. Rescue crews based in Exeter were requested to attend for structural monitoring. A cordon was put in place after the roof collapsed and police were also called out to close the road between Westfield and the High Street. Firefighters are still there working this morning.